"Faith in Christ was not simply belief about an event that had happened some time before, but a sense of Jesus as risen and exalted, as Lord, in their ongoing daily living--including their theologizing. The most important factor of the resurrection, as with most of scripture, is not whether or not it happened. The question of the historicity of the resurrection was, prior to the enlightenment, never something to be proven evidentially or scientifically. After all, who cares if you can prove it unless there is something beyond the historicity of the matter? The weight of importance and the kind of proof we need to provide, even if we've already provided scientific proof, is in whether or not it works. Does the resurrection do what it claims to do? 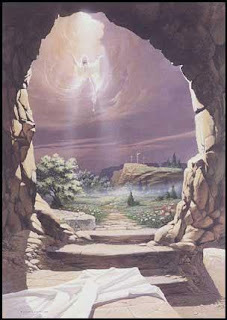 Does the resurrection offer victory over death (John 11:25-26, Rev.20:6), freedom from sin (Gal. 5:13), fellowship in sufferings (Philippians 3:10), and New birth (1Peter 1:3)? Does it actually make people to live toward a new kind of reality where death has no power and therefore gives no power to the kings of the nations who thrive on fear of death? Does the resurrection bring hope to the hopeless and love to the loveless, does it rebuild God's Temple in the Body of Christ? Do "Children of the resurrection" (Luke 20:36) offer to the world an alternative to the ways of "Rome" and of the curse of sin and death? Or do those who call themselves Christians simply continue to live as though the resurrection never happened, as though the only thing different about them is what they do on Sunday morning, as someone "who looks at his face in a mirror and, after looking at himself, goes away and immediately forgets what he looks like" (James 1:23-24)? Belief in the resurrection, as Dunn states about the first Christians, is "a lens through which..." we can view "scripture and indeed everything else." It becomes our hermeneutic for life and the formula by which we interpret all that we experience. Everyone has a lens, everyone interprets their experience, whether it be by "objective" reasoning or by what their tradition has told them, and everyone trusts their formula with a measure of faith. For us, if our formula is the resurrection and if we trust it by any measure of faith at all, reality should be changed. A new reality should invade the reality we see around us, offered by God's people through the Holy Spirit, a whole new way and a whole new logic guided by a whole new set of values. Simply put, this means that the resurrection should change us and our communities. If Christ's resurrection is saving us from our sins then the only acceptable proof of that will never be found in some artifact or scientific discovery but only in our lives. As people encounter communities of the resurrection, churches of the risen Christ, and they find acceptance, love, relentless compassion, active pursuit of peace, and unwavering courageous hope and faith, and they are asked "who do you think has been risen from the dead? Whose way do you think is better? The way of God who offers the new reality of which we've only seen a glimpse, or the way of corporate America, or the way of sin and death?" Of which do you think they will be more convinced? Which way offers hope and the best "proof" of a future therein? The proof isn't in whether or not it happened and the importance is not in whether or not we believe it happened. The proof and the importance are in whether or not it happens in us, whether or not we and our communities are changed by Christ's saving work, whether or not we offer something better. May we step out from the tomb of death and into the garden of new creation.